CHICAGO—(June 29, 2012)—ITRA Global, one of the largest real estate organizations devoted to the representation of corporate tenants and occupiers of commercial real estate worldwide, has announced that the Utah Governor’s Office of Economic Development will sponsor the ITRA Global 2012 Corporate Real Estate Symposiumon September 12, 2012 at the Park Plaza Victoria London, 239 Vauxhall Bridge Road, in London. Dr. Ronald R. Pollina, Chairman Emeritus of ITRA Global and President of Chicago-based ITRA / Pollina Corporate Real Estate, Inc, says the event will be a tremendous resource for company executives who must navigate a significantly changed global marketplace. “Utah is a true success story, thanks to enlightened political leadership that understands what it takes to create jobs,” he explains. Spencer P. Eccles, Executive Director of the Utah Governor’s Office of Economic Development, and his team look forward to introducing corporate executives to the state’s business friendly environment, low costs of doing business, and diverse, innovation-based economy. Divided into two sessions, “Doing Business in the Americas” is a premier all-day event featuring top corporate executives and noted economic development officials from around the world. One session will include economic development executives from government agencies in the Americas, who will address issues ranging from labor availability and costs, to transportation capabilities, taxation and much more for companies moving into their regions, along with other facility and location factors. The other panel, comprised of top global corporate executives, will help European companies understand how to increase their competitive advantage and profits with corporate real estate and obtain a better understanding of facility availability, build-to-suit and leasing vs. ownership options in the Americas today. To inquire about sponsorship opportunities or to learn more about panel discussions at this event, contact Beth Wade, ITRA Global Executive Director, in the United States at 1.706.654.3201 or email bwade@itraglobal.com. To learn more about conflict-free representation and the worldwide representatives of ITRA Global, please visit www.itraglobal.com. CHICAGO-(June 28, 2012)-Executives from major European will learn of investment opportunities in São Paulo at the symposium “Doing Business in the Americas,” which will take place in London on September 12 this year. Investe São Paulo will participate in and support the event, which will be organized and hosted by ITRA Global, one of the largest organizations in the world in the corporate real estate sector. “It is an excellent opportunity for us to interact with executives who are interested in expanding their businesses in Brazil, showing that the best options for their investments are in the State of São Paulo,” says the president of Investe SP, Luciano Almeida. 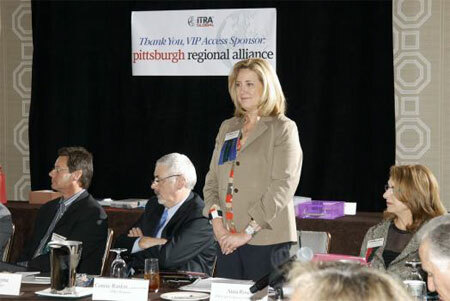 The Symposium Committee Chairman and President and CEO of Sloan Street Advisors / ITRA Global in Washington, D.C., Debra Stracke Anderson, highlights the importance of the involvement of Investe SP in the event. “The agency is an example of the economic dynamism of the State of São Paulo, which accounts for one third of Brazil’s GDP and occupies a prominent position on the world stage,” says Anderson. Divided into two sessions, the Symposium will take place on 12 September 2012. In one of the sessions, the president of Investe SP and officials from investment promotion agencies from several countries will discuss issues such as logistics and infrastructure, qualification of human capital and taxation. The other panel, comprised of executives from multinational companies, will discuss how companies can increase their competitive advantage and maximize profits in the corporate real estate sector. Investe São Paulo (São Paulo’s Agency for the Promotion of Investments and Competitiveness) was created by the Government of the State of São Paulo with the objective of attracting investments to the State and driving the competitiveness of São Paulo’s economy, promoting, therefore, the creation of jobs and the generation of income and technological innovation. To learn more, please visit the website at www.investe.sp.gov.br. To inquire about sponsorship opportunities or to learn more about the event, contact Beth Wade, ITRA Global Executive Director, in the United States at 1.706.654.3201 or email bwade@itraglobal.com. To learn more about conflict-free representation and the worldwide representatives of ITRA Global, please visit www.itraglobal.com. Customized Real Estate Services is also the Houston affiliate of ITRA Global, which Connie loves because 20% of its firms are woman-owned, a huge percentage for the CRE world. She tells us the organization is hosting a big conference on September 12 in London (above, Connie’s at its March conference in Pittsburgh). The purpose: Teaching European companies how to expand their businesses into America. Connie has some experience with that, helping London- based Swift Global find its first US office seven years ago (2,000 SF). It’s been steadily expanding since, and Connie just helped it ink a 14k SF lease here. Plus, Connie knows all about expansion: Her company has been named one of the fastest growing women-owned businesses in Houston for three years, most recently as the third-fastest. Connie Rankin, LEED, AP, CPM, is President and CEO of Customized Real Estate Services, Inc. in Houston, TX. Connie may be contacted at 1.281.931.7775 or by email at crankin@itraglobal.com.